Our vision at thepricegeek.com is to provide the market price of anything. 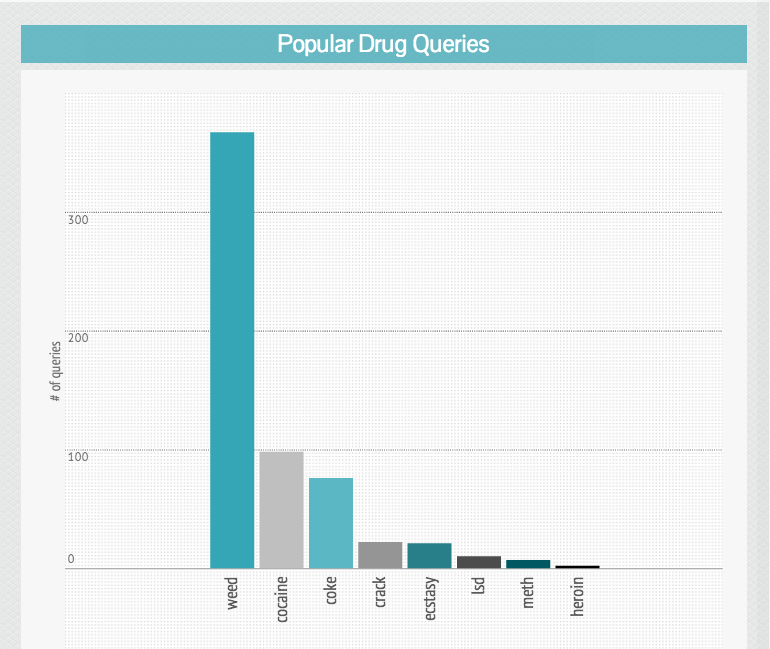 Lately, we’ve noticed a large amount of drug-related queries. Given our dataset is sourced from marketplaces and retailers such as eBay and Amazon, we have not been able to provide accurate results for these searches. 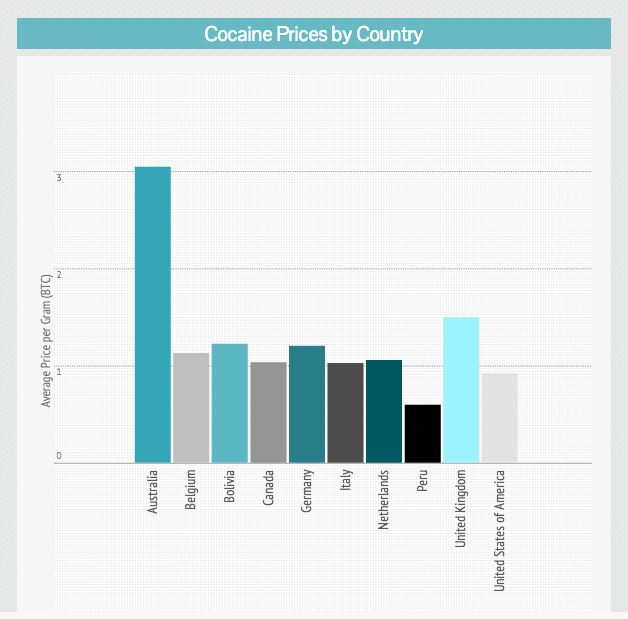 Most of these are probably joke searches, but to satisfy our own curiosity we decided to scrape price data from SilkRoad (an anonymous marketplace for drugs) and look for statistical correlations between market factors and the resulting sale prices of various illicit substances. After all, the ‘price of weed’ is a trending topic. SilkRoad is an anonymous marketplace for drugs which gained notoriety after a feature by Gawker . 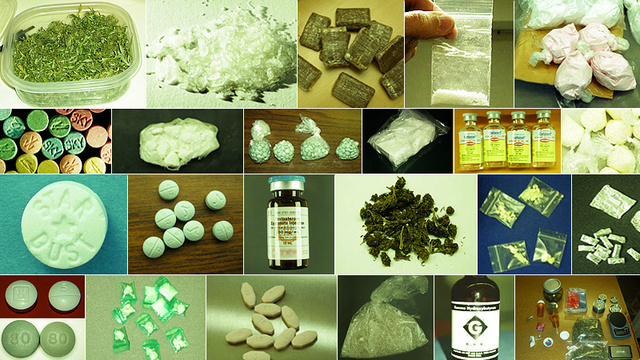 Whilst SilkRoad offers a diverse range of products, the majority of items are Drug Related . A number of drugs are offered on SilkRoad, but our drugs of choice (for analysis) are going to be weed and cocaine. 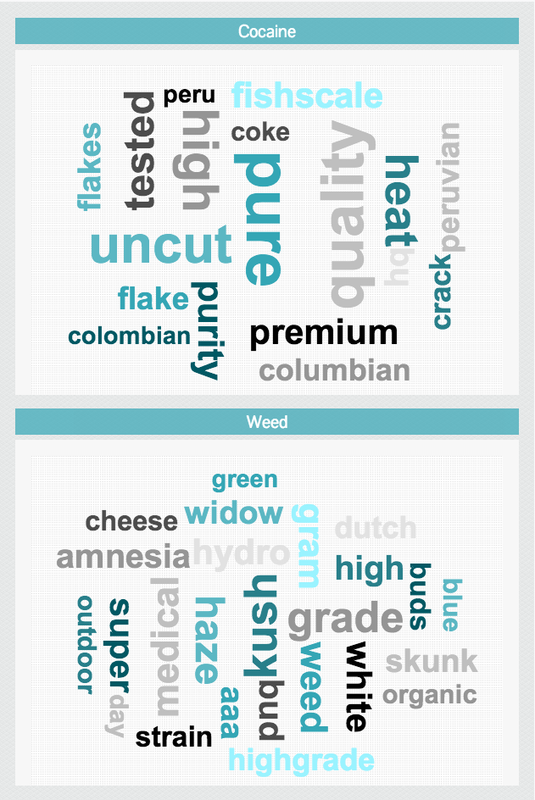 Below are some words commonly contained in the titles of weed and cocaine products on Silk Road. How much is a gram of weed? The short answer is – about $10 USD. How much is a gram of cocaine? The short answer is – about $100 USD . Not surprisingly, the location of a dealer impacts prices greatly. 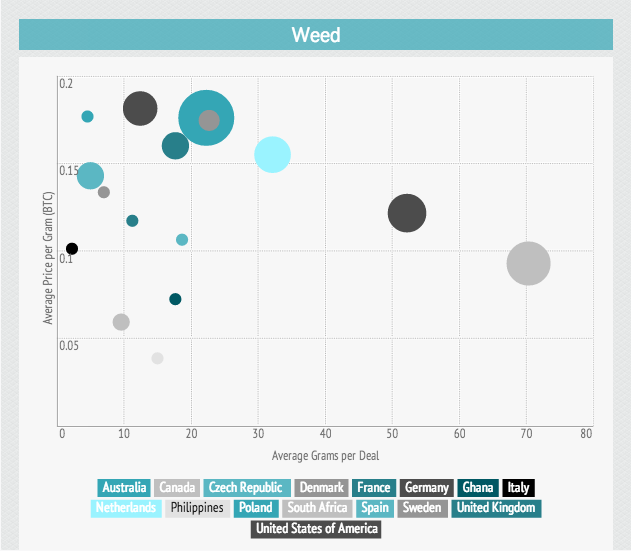 There is a stark discrepancy in cocaine and weed prices across the globe. 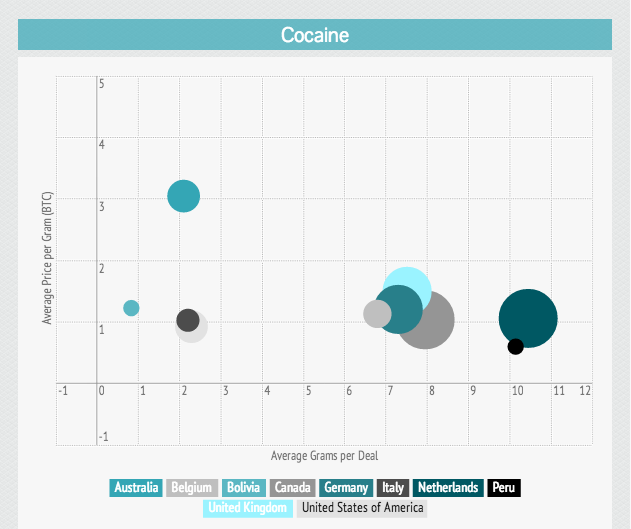 Cocaine prices in Australia are remarkably higher than the rest of the globe, selling at 3-4x the mean.One may wonder why opportunists haven’t captured the arbitrage opportunities that exists between cocaine prices. Just like any marketplace, economies of scale exists with large size purchases. Buyers are rewarded for bulk sized purchases with discounts on the price per gram. In the graph below, the size of the bubble represents the number of sellers in that country. Just like legitimate online marketplaces (eBay, Amazon), illicit online marketplaces and their sellers need to ensure a competitive advantage against their brick and mortar counterparts. 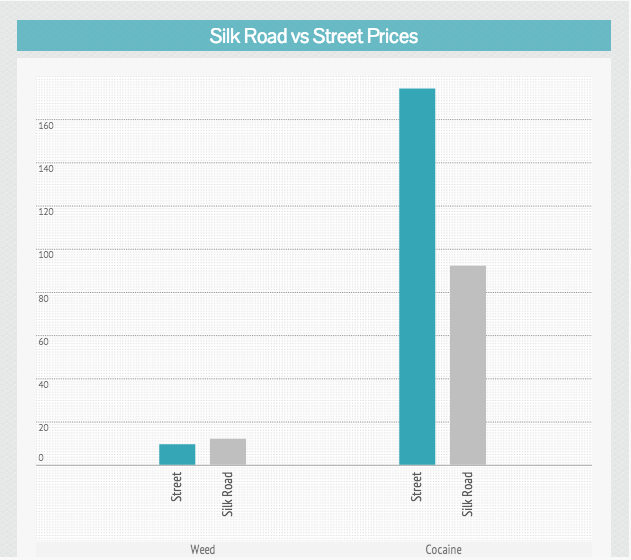 For cocaine, prices on SilkRoad are almost half the street price . Since the inception of TOR, packages such as the Tor Browser Bundle have made it significantly easier for consumers to access the the ‘dark web’. SilkRoad is also accessible on non-TOR browsers via http://onion.to, which is a web application that will forward your web request to the TOR network. As a result of this ease of access and public visibility, it’s not surprising that SilkRoad has seen intense scrutiny. Senator Schumer has called the US Attorney General and the Head of the D.E.A to put an end to it. However, this has been to no avail at this time in writing. As a matter of policy, we favor a laissez-faire approach. Ultimately, SilkRoad leads to a decrease in drug related violence, given the anonymity of the sellers. There’s no more bickering about who has the right to which corner. Rather, drug dealers will have to fight for better search rankings by increasing their feedback scores. SilkRoad also adds a level of transparency to the drug world. This is makes for a more efficient market where dodgy sellers are easily revealed through the feedback system. SilkRoad’s dedicated forums also provides a means for consumers to exchange tips on safe drug use. Lastly, drug abuse prevention is considerably more cost-effective than drug prohibition. SilkRoad uses Bitcoin as a means of transaction. However, we’ve converted all prices to USD for the purpose of comparisons. 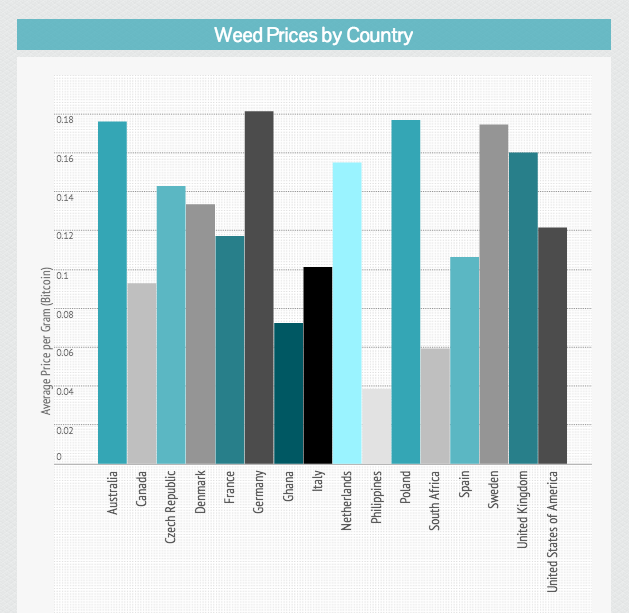 We used data from www.priceofweed.com and www.havocscope.com as a proxy for street prices. As always, we provide the raw data of our analysis so that our results are auditable.